Tungsten carbide is widely used as seal faces with resistant-wearing.high fracture strength.high thermal conductivity. small heat expansion co-efficient.lt is the best material to resist heat and fracture in all hard face materials. Tungsten carbide is widely used as seal faces with resistant-wearing, high fracture strength, high thermal conductivity, small heat expansion co-efficient. It is the best material to resist heat and fracture in all hard face materials. 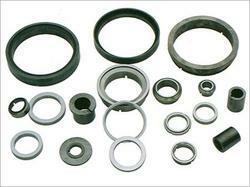 - Mechanical seal rings as per standard and special as per customer requirement. - Seal rings with Cobalt as well as Nickel binder. Enriched by our vast industrial experience in this business, we are involved in offering an enormous quality range of Tungsten Carbide Seal (TC Carbon Seal).